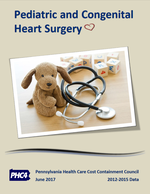 This report provides volume and risk-adjusted operative mortality data on pediatric and congenital heart surgeries performed in six children’s hospitals—five in Pennsylvania and one in Delaware—that volunteered to have their data publicly reported. Highlighted are results for ten widely performed surgeries meant to help patients and families make important treatment decisions. The report also shows the total number of operations performed by each hospital and separately reports outcomes for infants less than 31 days old. Data reported is for 2012-2015.